There are, of course, any number of entry points into the beginning of Jesus' Sermon on the Mount. Indeed, the richness and the familiarity of the text can make it difficult to know where to begin. Any one of the 'reversals' Jesus offers now is a gift, depending on your current experience and perspective. I only chose the first one because it spoke to me this week. For you see, last week I was awakened in the night with a terrible toothache. At first I managed to keep the pain at bay with ibuprofen, but the next afternoon I couldn't wait any longer so I set my busy schedule aside and made an emergency appointment with the dentist. X-rays showed that it was abscessed and spreading. Sternly, my dentist explained that I was to stay on the antibiotics until they were gone --- even if the pain should cease. We would do a root canal in a week. And so I went and stood in line at the pharmacy and had my prescription filled. I slept on heat the next couple of nights and kept taking a double dose of ibuprofen. At one point in this stretch of time, the pain was so intense, the pressure so great, I believed I would do just about anything, pay any price, for it to simply go away. Now here is the truth. I have always carried a certain amount of shame about my dental health. I brush regularly. I floss every day. I faithfully go for my six month checkups. Only, there are residual issues from all those fillings I had to have as a child. And while probably some of my challenges are inherited, the news of another cavity, the need for a crown, and the certainty of my receding gums always fills me with shame. And so this time when I was told I had a tooth abscess, that predictable reaction immediately kicked in again. Surely, I must be doing something wrong to have found myself at this point. Only no measure of guilt or shame --- self imposed or not --- could keep me from the dentist's chair. I would admit to anything and do whatever had to be done to get it taken care of. And I knew I couldn't do it on my own. As I've said, I am not normally the sort of person you would think of when you consider the 'poor in spirit' Jesus refers to in his sermon now. The poor in spirit, as I understand it, are those who live their lives fully knowing and demonstrating that they are utterly dependent on God. And while on an intellectual level I know this to be so also for me, I've spent a lifetime developing gifts and working on a persona of confident assurance which might just lead you to think of me as quite independent. I know that much of the time I would prefer thinking of myself in this way. And yet, all it takes is something as utterly humbling as a sudden toothache, or as complex and heart-rending as sorting out the medical issues of a loved one, or as startling as walking into work and being confronted by a problem I really didn't see coming to realize that I am not as 'independent' as I'd like to believe. Indeed, life itself pushes me to remember that I'm really not up to doing all this all on my own. That I am dependent on a whole web of people smarter and more experienced than I to help me move forward. Life pushes me to that place. Jesus' words now urge me to remember that at the very core of who I am, I am dependent on God to even be able to step up and out into the day. So yes, by this definition we are all poor. But to be 'poor in spirit' is not only to know it, but also to live like it is so. It's hard, at first, to discern just how this can be 'blessing' though of course. So yes, I find it helpful that Matthew offers Jesus' next words to us now. The poor in spirit are, indeed, blessed --- and specifically, they are blessed in this way. We are blessed by the gift of the very Kingdom of Heaven. And I expect at its core this gift of the Kingdom is ours in all of its fullness only when we realize that it is utterly and absolutely a gift. We can't earn it or deserve it. Not if we floss every day and keep our six month checkups faithfully. Not if we do our best to be and do good. Not even if we are actually 'good' for our 'good' will never be enough. For the gift of the Kingdom comes to us only through the unfathomable generosity of God. Indeed, in the same way that I would have given or done anything, cancelling any prior commitment to put my tooth abscess in the hands of a competent dentist, our life of faith works this way with us as well. At some point --- and yes, I would say over and over again --- I find myself there with God. I may do well and I may not do well --- for my life is, indeed, a muddle of sin and righteousness. Either way, poverty of spirit is living in the certain truth that it is all up to God and it is not up to me. And when I find myself there? Only then do I have a sense of the gift of the Kingdom of Heaven. Even for me. The next step, of course, is to wonder about what that means for how I live. What does the Sermon on the Mount point to when it speaks of the 'poor in spirit?' What do these words mean to you? Where do you find yourself on the journey? What has pushed you to acknowledge your own utter dependence on God? And what has that meant for how you live? When I was a little girl, I would practice walking around in the dark. I would watch, fascinated, as he made his way. I would quietly stand in the corner and see how he could fry his own eggs for breakfast. I can still see him touching the corner of the egg to 'see' if it was done! By feeling the rotary dial on the telephone in his kitchen,(remember, this was the 1960's!) he could call any of his sons or daughters. With his red and white cane he could safely navigate the length of the lane over the railroad tracks to the main road to get his mail. My mother tells me that he drove long after he should have. That my grandmother would sit beside him in the front seat and literally be his eyes. I'm also told there was talk in the family of getting him a seeing eye dog. Only at that point, he seemed just beyond getting the hang of it. And so he spent his last decades walking around in the dark, 'seeing' with his hands and his ears and his sense of smell. And it was so that he could sense your presence in the room long before you announced it. Not that my sisters and I were that good at making quiet entrance! Even so, I expect he knew a lot more of what was going on around him than many of us who actually 'see' often did. So sometimes, I would practice walking around in the dark --- emulating my grandpa. After a while I found I knew my childhood home by heart and could make my way through it quite well by feeling the wall and 'seeing' in my mind's eye objects I might otherwise trip over. Most of us don't choose to practice walking around in the dark -- especially not the sort of darkness our lessons describe this week. And yet, having done so much of it, I think we get pretty good at it after a while. In fact, I rather wonder if many of us don't simply grow accustomed to walking around in the dark. It may be the dark of grief or loneliness. It could be the darkness of uncertainty about what tomorrow will bring at work or at home or in the world. Or the darkness of unrelenting worry about children or grandchildren or aging parents.. Or the nagging sensation that something is not quite right physically but you can't quite lay a finger on it. It could be the darkness of the fear of job loss or the despair of long term unemployment. Or the darkness that accompanies depression or chronic illness. We have all gotten so good at walking around in the dark that maybe we hardly notice it after a while. Indeed, sometimes it's only when the light shines on us again that we can even tell the difference! You've heard me speak, some of you, of the darkness that descended on my family in the months after my dad died. It was in the spring of that year. It had been just long enough for me to begin to wonder when the healing would come --- when the light would return. I was home at my mom's for the day because my aunt and cousin were there to visit. Aunt Carol is as close to my mother as a sister can be, it seems to me. They were gathered in the kitchen and I had paused in the next room and picked up a copy of Time Magazine. And suddenly I heard them erupt into laughter. I remember feeling my heart catch in my throat for I hadn't heard laughter in that house for some time. I remember how the wonder of that sound was a little like someone turning the light on again. I sat down for a moment, smiling at the gift of their laughter, and kept paging through the magazine. Something caught my eye, something my dad would have been interested in and without thinking, I looked up and called his name. Forgetting. For the often taken for granted sound of laughter had taken me back to a happier time when such gladness was the norm and in that instant, I forgot that he wasn't in the next room to call out to any more. Almost immediately, the darkness descended on me again. I don't know if that moment was a gift of going back in time for just a moment or if it was the promise of what it yet to come. But it felt a little like a mean-spirited trick --- as though something amazing had been extended to me and then just as quickly had been snatched away. For there was no going back---I knew this in my next breath. And healing was still a long ways off. But the promise was there in that moment. Indeed, the promise still held that the wounds would heal and we would laugh again. That light would replace the darkness after all. Only God's promised light shining on us offers us so much more than even that kind of healing. This is the coming Light of Lights which will forever take us out of this present darkness. And the wonder of it is that this begins right here and now. Even in the midst of this dark place. We know this must be so for we hear it in our Gospel words from Matthew now. Because you see, I imagine that those disciples who Jesus called today had also grown accustomed to walking around in the dark. Now it could be that their lives were pretty good ones. Perhaps the business of fishing had provided well for them and their families. Maybe it was gratifying to them to be carrying on the work their fathers and grandfathers had done before them. Probably they had families to go home to and a community where they were held in high regard. Even so, we also know that they lived in a country that was occupied by the army of another. That they paid taxes to a ruler who was not their own. And it may be so that maybe one among them wanted to be a carpenter, or had it in him to be a farmer, but was needed on dad's fishing boat. More than that, we can also be certain, because they are human, that they had felt the inevitable pain of living with what may have been unspeakable losses. Indeed, there must have lived in them some longing for light, else they would not have abandoned all that had been so quickly to follow this one who promised them something more. Maybe they thought they had grown accustomed to the darkness. Perhaps they had finally given up hope for any kind of meaningful change. And maybe in Jesus' voice they saw to promise of light in their darkness. And so when Jesus walks by and calls their names and the light shines on them, they go. They just drop their nets and go. And we all know what happens next. 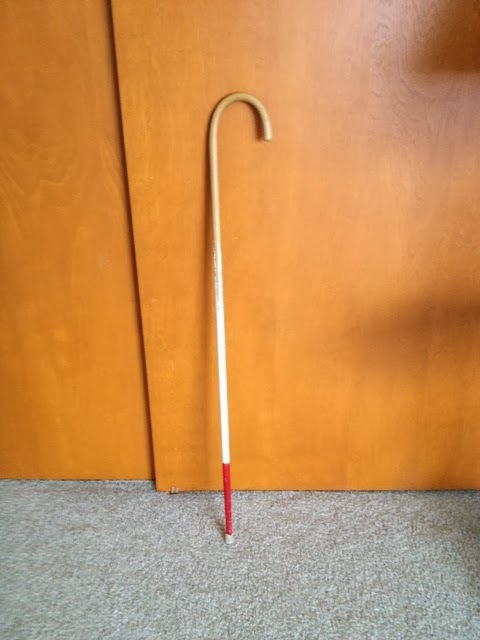 My grandpa's cane was a great gift to him when he was with us. It helped him make his way in the dark. Indeed, we hang on to it because it was a part of him. Even so, it is a symbol of another time. A time of just getting by, of just making do, of 'seeing' in the only way we can for now. It's a sign of a time of having gotten used to 'walking around in the dark.' But the promise is that the day will come --- perhaps signs of that wondrous day have already arrived as we hear the voice of Jesus calling us to step into the light of the new day that God has in store for all of us. What experiences do you have of light shining in your darkness? How do we experience light as we heed the call to follow Jesus? I always find it fascinating how memory works --- just what it is that can take us back in time in a heartbeat. This was so for me a few days ago. I bent down to pull on my winter boots. They have been especially well used this season between heavy snowfall and frigid temperatures and icy rain. As I bent down, I noticed that my boots are starting to show some wear. While much of it will probably wash off, the toes are scuffed with salt and dirt. In that moment's time I found myself thinking of Pastor Antti Lepisto who was my pastor and mentor and friend. I found myself recalling the winter before I started seminary: I thought of his boots --- and yes, for some reason I still remember noticing his boots were dirty in the midst of that particular long, cold winter. Why that image came to mind these thirty years later, I have no idea. With that visual memory, though, all the rest came flooding back as well. How he not only recommended his seminary of choice to me, but drove me the full seven hours north to St. Paul, Minnesota so that I would see it in person. How in those months he invited me to 'come and see' what this work of being a pastor was all about. How he allowed me to tag along on all sorts of pastoral errands: those day to day pieces of ministry which most people never see. For it is so that some things can't be explained with words or even fully understood with our minds alone. Sometimes we truly need to see and experience things first hand. Jesus knew this, too, of course. Indeed, I do love this little bit of the story which is ours to encounter this week. I can so relate to John's two disciples who, apparently on an impulse and prodded on by John's announcement of Jesus' identity, just take off after Jesus. Evidently they had no plan other than to try to get close to him, for when Jesus turns and asks them what it is they are looking for, they answer with a question: "Where are you staying?" Now it may be so that at this point John's disciples are simply trying to gather enough information so that they can then find a way to stay nearby --- just close enough so that they can listen in and tag along behind --- anonymously even: maybe at a safe distance. Or maybe they really didn't know just what it was they were looking for. Whatever the case may have been, Jesus doesn't answer their question. He simply invites them to "Come and see." And they do. They 'come and see' not only where Jesus was staying but they stuck around to see all that will follow. Thirty years ago my friend and mentor and pastor did this for me. I expect he knew that no amount of explanation could fully capture what makes up a pastor's week. (This, no doubt is also true for most other callings as well...) You really have to move the piles of papers off the passenger side seat and ride along to see for yourself. And you count yourself most blessed to be invited to do so with one who pulled on his boots and tromped through all sorts of piles of all sorts of things to get to where God was calling him to be --- to get to where God's people were. I expect it almost goes without saying that this is also true for us in our lives of faith. Oh, we spend a lot of time with books and words studying what it is we are called to believe. But it is only as we put our boots on --- and invite others to tag along --- that we really see what faith filled lives can mean for the life of the world --- and, in turn, for ourselves. And so it is that I imagine it's not only because it is different from the ordinary that our confirmation age youth seem to most enjoy those times we get out of the building on a service project: whether it is delivering Christmas cards to home bound folks or raking leaves or something else of the like. It's those times when they get to see faith at work, sometimes in extraordinary ways. It is as we see kindness offered and find a way to practice it ourselves. It is as we gratefully receive the generous gifts of others and learn to share, in turn, from what we have been given. It is as we are prayed for that we learn to remember to pray for others. It is as we experience forgiveness and then seek reconciliation where it has been broken between us. It is as we hear the call for justice and join others in working for it. It is as we 'come and see' in all these ways --- as the disciples did with Jesus so long ago --- that faith is born and grows and is passed on. "Come and see!" With these urgent words Jesus invited the disciples so long ago. With these words, we are invited as well. So "come and see!" Along with Andrew and Simon and all the rest, hear Jesus' invitation to come closer! And while you're pulling on your boots, think about just who you might invite to come along and see as well! Can you think of times when you were invited to 'come and see?' In your experience what difference did the 'seeing' make? Jesus' invitation to 'come and see' is a simple one today. How might you share that same invitation? What would you invite someone else to 'come and see' in your life of faith? In your experience, how does 'learning the faith' best happen? What examples would you share? I stopped at the County Court House the other day. I don't go there often --- as evidenced by my trying to get in through the exit doors. I quickly discovered that they had changed the entrance to another location where there is more room for the necessary security screening. Indeed, somehow I had forgotten that I'd need to take off my coat and empty my pockets and to pass with all the rest of the early morning crowd through the metal detector. Once I had gathered up my things, I made my way to the electronic board which told me which courtroom to go to. As I looked for the right location, the name of yet another person I knew caught my eye. It looked as though my time would be well spent that morning. So I climbed the stairs to the second floor and sat with those I had come to see for a while. Only, in such places, things go at their own pace and it looked as though it would be awhile before their case would be called. I excused myself, saying I was going to head to another courtroom to see if I could connect with another family. As I made my way up to the third floor, I ran into someone I used to know. But let me back up. I was not dressed professionally the other morning. Friday is normally my day off. We'd already had a quite a bit of light snow and the winds were threatening to start up and I needed to get to my mom's half an hour away to run some errands and begin to put away Christmas decorations. I didn't want to take the time to stop again to change clothes as I knew my travel window would be limited, so I went as I was. As I said, I ran into someone I used to know. And I found myself immediately explaining my presence in that unlikely place. Oh, I was surrounded by those for whom this was commonplace: from both sides of the bench. Not so much for me. And yes, many of the best people I know have found themselves in situations where it was necessary to spend time there. And yet, I quickly discovered this was an instinct I too easily followed. I wanted him to know I was not there for myself. (And yes, certainly, I would have been dressed differently if I had been.) It turns out he didn't care. Or maybe he had already assumed what I was trying to say. Either way, I discovered he was only eager to pull out his cell phone and share a picture of his new baby girl. "Let it be so now; for it is proper for us in this way to fulfill all righteousness." Oh yes, I do come to this today with my own deep awareness of my own unwillingness to do as Jesus did ---who simply stood with sinners, with those who have been broken by life. Jesus, who felt no need to offer an explanation, but who simply stepped into the cleansing waters of baptism with all the rest of us who do, in fact, so need it. It is clear to me that I am a long ways from where I'm meant to be. It is also so very evident to me today how much I am in need of a Savior who would step into the waters of baptism before me and with me --- and who would later be baptized by a kind of fire I cannot imagine. And who did this for you and for me. I'm standing still in this for now, praying that I might have the courage next time to not so quickly try to explain my presence wherever it is I may be called upon to go. And to simply stand with those who are broken and afraid and hurting. As Jesus did. As Jesus always did. What do you think Jesus means when he says to John that this is the way to fulfill all righteousness? If we understand baptism to be for the forgiveness of sins, why, then was Jesus baptized? What does it mean to you that Jesus walks into the waters of baptism with you? How does this truth inform your life?